In a medium bowl with an electric mixer on medium speed, combine all-purpose flour, powdered sugar, and salt. Cut in ½ cup butter until mixture is combined. Press dough evenly into an ungreased 9 x 9 baking pan. Bake crust 12-15 minutes until edges begin to brown lightly. Meanwhile, melt ¼ cup butter in a medium saucepan. Add brown sugar, water, and lemon juice. Combine thoroughly. Bring the mixture to a boil and cook for 1-2 minutes. Remove syrup from the heat. Add sliced almonds and almond flavoring. Spread almond syrup mixture evenly over shortbread base. Return the pan to the oven. Bake bars for another 12-15 minutes until surface is golden brown. Remove the pan from the oven. Allow shortbread to cool for 10 minutes. While shortbread is still warm, use a sharp knife to score it into score cookies into 1 ½ inch squares. Let shortbread cool in the pan completely. Use a spatula to remove cooled bars from the pan. 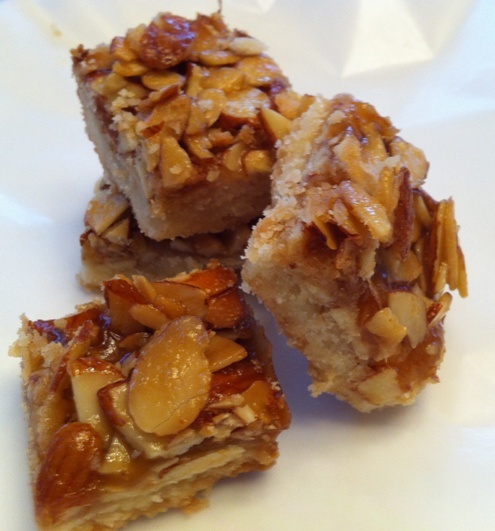 As you prepare the syrup layer for Almond Shortbread Bars, allow the mixture to boil just 1-2 minutes. Too short a boil time will render the layer too soupy. If you boil too long, the syrup layer will harden when spread over the shortbread base and be difficult to cut. The top layer of the shortbread bars may appear loose when baking is finished, but it will become firm as bars cool.